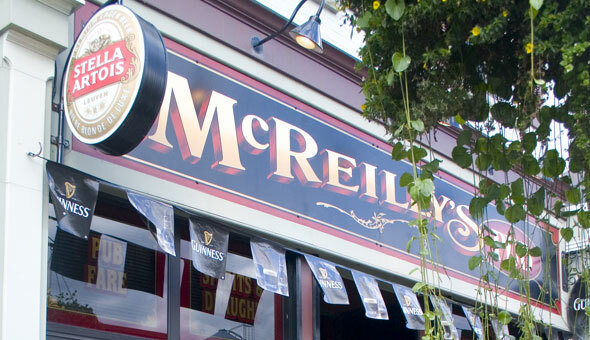 Since 2003, McReilly’s Pub has been associated with friendly service and rich gastronomic experience at 82 Dunlop St. East in downtown Barrie. What else would you expect from a local pub? But there’s more to come. McReilly’s dishes are as delicious as home cooking, their draught beers are varied and mouthwatering, and their cuisine is a tasty mix of English, Irish, Scottish, and Belgian treats. On top of that, McReilly’s Pub is simply a terrific place to talk about life as it is. McReilly’s Pub is ranked high as a place to have lunch at. Vegetarian or Hipster burgers cooked at McReilly’s are exclusively tasty. Salads, meat, sandwiches, roast beef, finger food, and draught beers are all praised lavishly. Visitors mention this place as an excellent choice for a Sunday afternoon with family. One can have a walk along the waterfront and then drop in to have a bite and spend a couple of hours in a clean and comfortable interior. The walls are decorated with old photos, which add some unforgettable local colour to the place. Some clients would like to have more light and space inside the pub. Among other things, McReilly’s Pub has earned its reputation due to special offers on Fridays and Saturdays, and enjoyable board game competition nights for lively companies. The pub also hosts fun-filled quizzes where all you have to do is try your smartest countenance on and scream out answers. At McReilly’s, they know how to make things unusual. For instance, you can enjoy an annual silly and charming Anti-Valentine’s Day party here with special guests popping up. The pub occupies an old building on Dunlop Street, where the authentic style of a British pub is recreated to the smallest detail. The cosy and relaxed atmosphere of the place is reached mainly due to its being quieter in comparison to other pubs along the street. Plus the owners are always vigilant and responsive, placing quality control on top of other things and caring about customers just as real hosts would do.